Here are some ideas for you to use while teaching To Kill a Mockingbird. I have included Unit Goals, Pre-Reading Activities, During Reading Activities, Reading Strategies, and After Reading Activities. If you would rather have all your prep work done with a full unit plan for To Kill a Mockingbird with lesson plans, a unit calendar, printables, quizzes, PowerPoint presentations, and much more, please see my Ultimate To Kill a Mockingbird Unit Plan. Students will have increased awareness of the central issues in the novel: Maturity & Coming of Age, Racism, Social Hierarchies, Class & Gender Discrimination, Parenting, Education vs. Schooling, Hypocrisy, Rumours & Gossip, etc. Students will develop their ability to read and interpret literature. Students will internalize reading strategies. Students will make connections between issues in the novel and current events. Students will understand and be able to apply literary terms such as, narrative voice, symbol, episodic narration, characterization, theme, verbal irony and style. Students will write an essay that examines an aspect of the novel. Eyes on the Prize: View the segment on the Montgomery Bus Boycott initiated by the actions of Rosa Parks, or the segment on the murder or Emmett Till. Related Readings: Bring in one or several articles on varying levels of discrimination and/or racism. These articles should spark a lively discussion. For variety, conduct the activity as a jigsaw, with each group getting a different article to read and summarize (verbally) for the class. Scrapbook: Students collect articles on current events related to the major issues in the novel (see the list under unit goals). Research project: Students can research current of historical events related to the novels major issues. Line Toss: Work in groups of 6. Each student has an important line from the novel. Within the group, a ball is tossed randomly. Each person who catches the ball must read his/her line before tossing the ball to someone else. First School Memory: Have students write a short response on their first clear memory of being in school. Students may choose to expand these into short narratives. Talk show on Scouts First Day of School: Assign students to various character roles (Miss Caroline, Jem, Walter Cunningham, Little Chuck Little, Burris Ewell & Atticus). Have “Oprah” question each character about that first day of school. Quick Write: Select a key line from that day ‘s reading and use it as a prompt (or as the first line) of a quick write. As students write, give them other words from the chapter to incorporate in their writing. Music: Select theme songs for important character. How does each song suit the character? Value line: Have students stand on a value line to rate Atticus as a father. Ask various students to give their reasons for the ranking. Qualities of a Good parent: Brainstorm qualities of a good parent and discuss how Atticus measures up to them. This can end as a discussion or it can lead into· an argumentative paragraph. Talk show: Assign students to various character roles (Mrs. Dubose, Aunt Alexandra, Miss Stephanie, Miss Maudie, Calpurnia, Uncle , & Atticus). In a talk show format, have each character comment on Atticus’s skill as a parent. Mayella Ewell: Victim or Criminal? Debate: With 15-20 minutes to prepare, students should be able to generate enough for a lively debate. Argumentative Paragraph: This paragraph can be a follow-up to the debate, or it can stand on its own. Maycomb Social Hierarcy: Have students draw a pyramid and place on it all of the social groups in Maycomb. Provide a rationale for each placement (and perhaps a quotation). Concept Attainment: Prejudice vs. Discrimination. Use the concept attainment method to help students distinguish between the two of these. Improv: Have groups of students improvise the dinner conversation at the Ewell’s home during the court recess. Tableau: Have groups of students prepare tableaux of important scenes for review. Character Walk (as Boo Radley): This is a powerful exercise for helping students understand the debilitating impact of rumours and gossip. Students form two rows facing each other. These students represent the people of Maycomb and will repeat the rumours and gossip about Boo. Other students play the part of Boo Radley and walk between the lines of students, listening to the gossip. All students should have a turn to play both Boo Radley and the general public of Maycomb. Examining Style: Have students read and listen to Martin Luther King’s “I Have a Dream” speech. Ask them to pick out anything that makes this a memorable speech. Introduce the concept of style as it applies to writing. Look at page 279 in To Kill a Mockingbird and talk about the style of writing used to express Scout’s thoughts and memories. Summarizing: Students summarize events as they read. Initially this might be every few pages. It can also mean a verbal summary with a partner at the end of a chapter. Guided Reading: Stop several times during oral reading to have students write a 2 sentence summary and to compose 1 question. Students can internalize this strategy and use it while reading silently. Key Words: List key words for the upcoming passage, define them with students and ask students to look for the words in that day’s reading. E-zine: Students work in groups to create an electronic magazine on an issue linked to the novel. To complete this project students will demonstrate computer use skills, research skills and literacy skills. Thanks so much for the excellent tips on teaching To Kill a Mockingbird. It’s nice to have a selection of approaches to engage the students and I look forward to using many of them. Wow! All of these wonderful ideas, and for FREE! Thanks for all of these ideas. I appreciate how you have broken it down into the three stages of exploring a text: before, during, and after. I am just starting To Kill a Mockingbird with my grade 10 class, and these ideas will be a big help. I am especially keen to try the e-zine project. Do you have a marking rubric for it? Thanks. This is a great starting point for planning a To Kill a Mockingbird unit. I think it’s great that you are sharing this with other teachers. Thanks. I love the idea to have the students make a talk show about Scout’s first day of school. I Can’t wait to see what my grade tens come up with. The gossip lines idea also sounds interesting. Thanks. Thanks for all the great ideas. I love To Kill a Mockingbird, but I haven’t taught it before and I am a little nervous to tackle this classic. Your blog has given me a great start on planning my unit. Thanks again. I am at the end of The Novel block teaching To Kill A Mockingbird to my 9th grade class. I have come up with several ideas that were effective and fun. I’d like to share a couple of them with you. 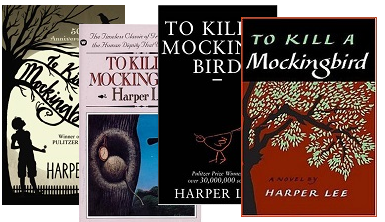 The first one is to have the students write a scene that is not in the book using Harper Lee’s style as a way to further develop the student’s understanding of the characters. For example, my class wrote the scene in which Jem goes to retrieve his pants from the fence through his eyes. Another scene could also be Walter Cunningham’s inner dialogue while Scout is talking to him in front of the jail. The second activity we did was to study some of the photographs from the Farm Security Administration and answer basic who, what, when, where, and why questions as a way to deepen our understanding of the time period in which the story takes place. This entry was posted on February 27, 2013	and is filed under Lessons, Tips and Ideas. Written by: SusanAnderson. You can follow any responses to this entry through the RSS 2.0 feed. You can leave a response, or trackback from your own site.